When one begins thinking about pursuing a degree in the arts, there are several routes to consider. Institutions vary: students can choose between two-year community colleges like Northeast Community College in Norfolk, Nebraska and four-year institutions like the University of Nebraska-Kearney. Or, they can opt for a fine arts university like the Kansas City Art Institute in Kansas City, Missouri. Students can pursue both two- and four-year degrees in many fields of art, including fine arts – visual art, music, dance and theater – as well as graphic and digital art and art education. Many bachelor’s and master’s programs in the arts also include internship opportunities to work with seasoned and experienced experts in the field. Those studying art education will have a student teaching or field experience lasting 10-18 weeks, typically the semester prior to graduating. I was personally afforded limited elementary art education in primary school. My exposure to visual arts came in middle and high school. Knowing I wanted to teach, I went to Wayne State College and received my Bachelor of Arts in education - K-12 visual art and 6-12 speech communications. I was fortunate to land my first job in Lincoln Public Schools where I've taught elementary art for the last 29 years. It is my calling to serve children through visual art. As an elementary art educator, I don't often get the opportunity to see where my students progress to through middle school, high school and beyond. On occasion, however, I am honored to receive a graduation announcement from a graduating senior and am happy to hear that the work I did with them in elementary school impacted the direction of their professional life. I fondly remember one student who decided to pursue fine arts and attend the University of Nebraska-Lincoln. He had taken art classes in middle school and high school, continuing to recognize in himself and share with others his talents in art, design and creativity. If you are unsure which path to choose in the arts, contact your high school counselor or art department chairperson of your local college or university. The arts are a viable path for many; a career path that can help those with creative flair and insights achieve a dream of success and personal satisfaction! 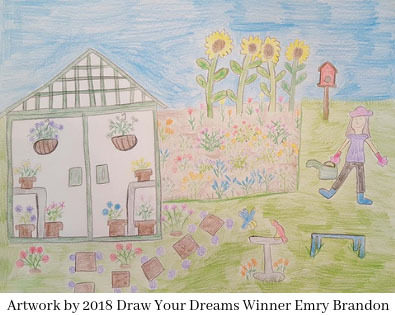 Bob Reeker is a K-5 Visual Art Educator at Elliott Elementary School in Lincoln, NE, an adjunct instructor at Nebraska Wesleyan University, a Past Co-President of the Nebraska Art Teachers Association and a scorer for the annual NEST 529 Draw Your Dreams contest.